What’s most amazing to me is that the hacked-together multiplayer server hasn’t crashed once since the game went live, serving more than 22 thousand player sessions I expected it to need more handholding or even bugfixing 😉 there have been some bugfixes on the client side (see changelog) but overall it’s been relatively smooth sailing. I’m in and super excited about making a game once more! Ludum Dare starts at 3AM local here in Germany, the plan is to get a general idea and some code working until morning. Unfortunately, I have a family function to attend to on Saturday, but Sunday is pretty much reserved for LD. If it isn’t enough, going Jam is always an option, but I’ll try hard to make it until the Compo deadline. Hey everybody, I’m very happy to be part of this once more! I noticed the streaming widget is absent from the LD website (don’t know if PoV plans to bring that back), but just in case I made a simple streaming feed app as my LD warmup exercise. Be sure to check out the Theatre Mode as well, it cycles through all the active streamers in order, and shows you 60 seconds of each stream (with the ability to pause and jump forward when you want). It’s designed to be left running in the background and give a good overview on what everybody’s working on. Even though I participated in many LDs now, I never actually published a game. Last month, I was sitting together with a good friend of mine and we lamented our habit of working on these lengthy projects in private, only to discard them eventually and then start something else. We decided to change this, to start putting things out there! So we came up with this: we’re making one game every month of 2016, and we’re publishing every one of these games, as we hopefully get better at this over time! It’s a turn-based retro strategy game, available for free on itch.io, for Windows, OS X, and Linux. In this game, you take on the role of Commander Wallis, a medieval watchman who must protect the shrines of the Holy Spheres from a sudden onslaught of tentacled beings of unknown origin. It is your job to prepare the defenses, place troops, and then coordinate the battles. We focused a lot on strategy aspects and issues of balance. As you progress through the levels, you get access to more types of units and defensive measures, and we wanted to make sure every unit and item in the game has a unique purpose. This is a personal moment for me. For a non-game programmer like me, Ludum Dare has over the years been a tremendous creative outlet, and it’s these LD experiences that ultimately prompted me to try game development in earnest. What we need most of all is feedback, doesn’t matter if it’s negative, but it has to lead us towards actionable items on our upcoming games. I’m in once more! Really looking forward to it. I’ll probably do a browser-based game again, most likely without using an engine (Three.js and/or Pixi are always an option though). I don’t like lengthy post mortems, but for the sake of documenting things, here we go! I usually don’t think much about the possible theme until it’s announced. However, this one caught me a bit off guard. I mostly drew a blank. In the end I had several ideas: a game about WMDs where you destroy planets because it’s your job; or a game where your weapon is literally an old spoon and the catch is you’re playing a rat who’s having an adventure. Then I inexplicably decided to go with the most unworkable one: you’re a wizard using a cornucopia-thing that summons monsters. 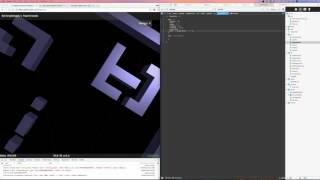 In WebGL, with which I have very little experience. In an artsy diorama style. Yeah. I streamed part of the development live, still learning not to be distracted by it… And I got my first real viewer who talked to me in the chat and everything. That never happened before and it was thrilling! I didn’t switch ideas around for hours as I usually do, just to experiment with my creation process. Turns out though tinkering with completely different ideas for hours was probably a better process for me. I fought the need to start over with something different until the end, and delivered a much worse outcome because of it. Development moved along at a glacial pace, and I felt more and more uninspired as time went on. The concept was one of those things that sounded great in my head, but lots of little details didn’t survive contact with reality. Still, the idea might still kinda have worked if I had had access to an art person or team. I’m not a game developer (LD is the only game dev activity I do), so learning from the experience is always the most important part here. My “old” methodology worked better, even if I sometimes produced uneven results. I clearly thrive on experimentation, which I heavily curtailed this time. Next time, I’ll be open to explore several game ideas again before I settle down. Or alternatively, I need a buddy whom to bounce ideas off. I would also like to produce either a story-telling or a simulation/building game next time, this shooting stuff doesn’t seem to work out for me. This time everything will be different, yeah! This time, I’m going to make a game that rocks! I wish everyone a happy and successful LD 32! You know how sometimes while you’re doing something you realize it’s not going to work out but it’s too damn late to change course? This described LD31 for me. It was Sunday when I knew “Snowma’am” wasn’t going anywhere but I stayed around to see it through anyway. Be ruthless in throwing out bad ideas, even if you already invested time in them. Focus on gameplay and fun – if there’s one label for my failure, it’s “complete and utter lack of fun”. Graphics and music are not that important. I spent inordinate amounts of time on these just to make something which is not… good. Let people test your stuff early, get feedback early. Don’t put it off “until it’s done”. If the game doesn’t work, it won’t all magically come together one hour before submission, yet that’s what I told myself at the time. Don’t do other stuff on that weekend. I wasted basically the entire Saturday, and in the evening I went to play a Call of Cthulhu adventure with some friends until 4 AM. It’s no surprise this didn’t work out in the end (neither did the Cthulhu session by the way: Azathoth destroyed the world). Cut yourself some slack if you’re in a bad mood. My cat died recently and I expected my LD project to take my mind off of it. It didn’t, on the contrary, because she was always there whenever I made an LD game. Anyway, I swear to do better next time! Snowma’am signing off. So I was technically awake when the theme was announced (3 AM here), but too drained to do anything. Alright: entire game on one screen! It’s probably going to be 2D again, I think I know what to do: a wargame/strategy thing… with everything… on one screen. Well. Really pumped!!! 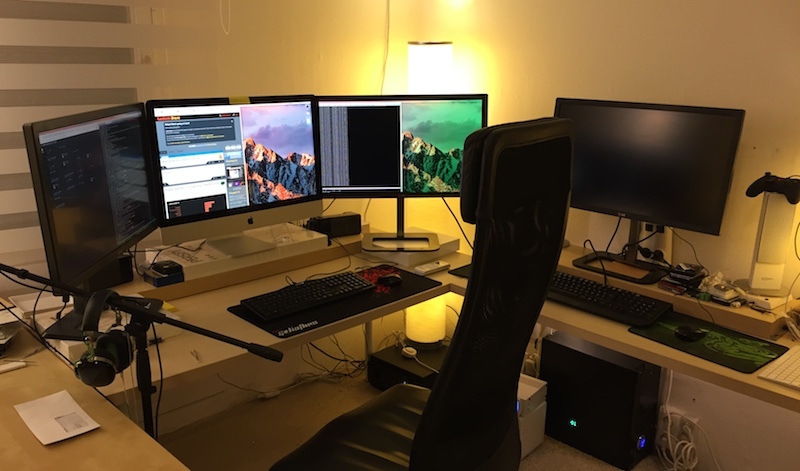 This is where I LD, new setup! If you’re not adverse to the command line on the Mac, you can use simple scripts to put together a timelapse of your LD – no special software needed. 34 queries executed in 0.117 seconds.